The primary purpose of this contract is to support UNICEF’s work with the IASC on protection from sexual exploitation and abuse. The consultant will support the team working on this issue at headquarters. UNICEF is committed to preventing and responding to sexual exploitation and abuse (SEA). UNICEF is actively engaged in policy and operational efforts to improve the reporting of SEA, offering support to survivors of SEA, and promoting accountability. UNICEF also promotes internal and external change to end tolerance for all forms of exploitation and abuse. UNICEF works closely with the United Nations Special Coordinator mandated by the Secretary-General to facilitate implementation of his Special Measures report. 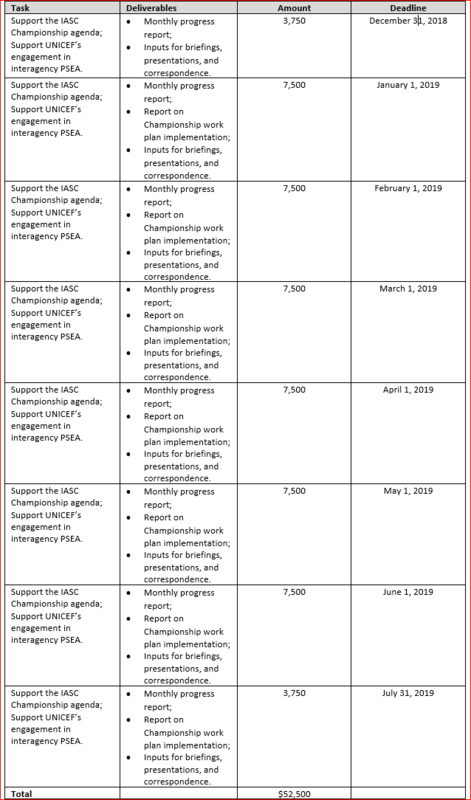 In mid-2018, UNICEF’s Executive Director took on the role of IASC Champion for PSEA and Sexual Harassment, charting out an agenda for accelerated implementation in humanitarian settings. This work entails collaborating closely with the IASC membership at leadership and technical levels for conceptualization, endorsement, and operationalization. The IASC Champion works closely with the Emergency Relief Coordinator, UN agencies, and NGOs to support humanitarian coordination at country level in advancing the PSEA agenda. Child safeguarding, including protection from sexual exploitation and abuse (PSEA), is at the core of UNICEF’s mandate. As a humanitarian agency dedicated to child rights, we take all steps necessary to safeguard children within our operations. The primary purpose of this contract is to support UNICEF’s work with the IASC on protection from sexual exploitation and abuse. The consultant will support the team working on this issue at headquarters. The Consultant will be supervised by Tasha Gill, Senior Advisor, Child Protection in Emergencies, and will collaborate with Katherine Wepplo, Child Protection Specialist, PSEA and the PSEA/SH Coordinator in the Office of the Executive Director. Support the development and roll out of UNICEF-led PSEA ‘global goods,’ including protocols, tools, and relevant guidance documents. Support UNICEF’s resource mobilization initiatives through the development of funding proposals and preparation of donor reports. The consultancy will be based at UNICEF headquarters in New York with limited travel. Advanced university degree or equivalent in gender studies, social anthropology, law and women’s rights, sociology, public health, or other field related to PSEA. At least 5 years of humanitarian or development experience, preferably including implementation of a GBV or child protection program in a humanitarian context. Ability to work with NGO, government, and international organizations. Demonstrated experience in collaborating with multiple actors with diverse equities. Experience in drafting policy and/ or guidance documents. Experience in roll out of policy and guidance preferred. Experience in building knowledge and commitment among technical and management staff. Experience developing and facilitating trainings and workshops within the international development sector preferred. Deep understanding of child protection and/or GBV guiding principles. Demonstrated understanding of issues related to confidentiality, data safety/security and other ethical concerns related protection issues. Excellent analytical, communication, writing and editorial skills in English. Proficiency in an additional official United Nations language (French, Arabic or Spanish) is a bonus. Excellent computer skills, including MS Word, Excel, PPT, etc. Flexible work attitude: the ability to work productively in a team environment as well as independently, and the ability to handle requests or issues as they arise. Excellent interpersonal and communication skills: the ability to successfully and effectively liaise with people in a wide range of functions in a multi-cultural environment.